“The latest in this trend is the meme showing a fat little girl titled ‘Lil Diabeetus snacks’ as a take-off to Little Debbie Snacks. It’s being bandied about on FaceBook as ‘cute’ and ‘funny’; an appropriate name change. Is it funny? I don’t think so.” Kate weighs in on the Facebook meme. Tuesday’s #dblogcheck was a community success, and seems to have woken up many of the sleeping bears (if you want to picture blog commenters as sleeping bears, which I do, because that’s adorable). Check out Chris Snider’s excellet Storify recap of many of the blog posts and be sure to say hello on some new and old blog favorites. Wendy’s daughter has gone to Clara Barton Camp … and she’s also gone BIONIC. “Athletes inspire kids with diabetes at Friends for Life Conference” is the title of this video, but I’m going to assert that adults are pretty inspired by Charlie and Jay, too. An eighth grader took She Still Smiles and made it into something really, really cool. Read about Talia’s project here. “Her former team dismissed her for having diabetes. Her coach and teammates stood by her and struck out on their own.” Read more about Rebecca Young here, and consider supporting her! I sent emails to my representatives. Now it’s your turn. The “Fakeabetes” Challenge – pretending to be a PWD for the day! Read more from Kim and Whitney on this day with diabetes. JDRF appoints Derek Rapp as new President & CEO – here’s more information on this change in leadership from the mothership itself, and a post about the changing leadership of ADA and JDRF on Diabetes Mine. “Why Should Diabetes Advocates Enter This Food Fight?” Hope Warshaw explains. “ADA and others have sent in their comments, but the FDA needs to hear our individual voices as advocates.” You can give the FDA your thoughts on the proposed Nutrition Fact Label, and you have until August 1st to do so. More on the how, and why, at Diabetes Advocates. The FDA will host an online conversation (“A Virtual Town Hall”) for people with diabetes on November 3. And, according to the crew at diaTribe, they want to hear from you! Click this link for more information and the link to email diaTribe, and you can also join the conversation on Twitter using the #DOCasksFDA hashtag. My favorite part of this video? “I can read.” Love, love, love. Friday Six: Masterlab, TypeOneNation, and Jim Turner! The Friday Six: Poutine Edition. 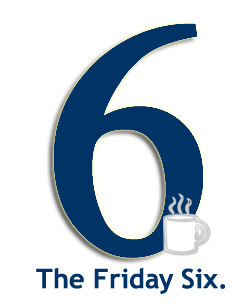 The Friday Six: Haven’t Done One in a While Edition Friday Six: DBlog Week, Small, and BAMWD! Friday Six: DBlog Week, Small, and BAMWD! OMG. I made it to the SUM Six! I really enjoyed the Words of Hope video. It’s very encouraging to see those smiling faces in addition to reading about the tremendous progress with new technology toward a functional bionic pancreas. I’m testimony to the fact that you can live a very full and rewarding life with type 1 diabetes since I’ve lived 59 years and I’m still going strong. Wow, you are a great writer. Thanks for the post Kerri.